Chelmer Valley High School this year supported the Jermain Defoe Foundation shoebox appeal supporting vulnerable children in St Lucia and Dominica. The Jermain Defoe Foundation is a UK-based charity whose aim is to help underprivileged children in the Caribbean and the UK. Students were asked to bring in either a completed shoebox or bring in items that could go in a shoebox and make shoeboxes as a form group. Students won valuable points for their house which went towards winning the Service Cup. The year groups who brought in the most boxes also won a prize. Year 9 won with a total of 63 boxes and Einstein won with a total of 51 boxes. These were collected by the foundation and will be sent to St Lucia for the Jermain Defoe Foundation shoebox appeal. 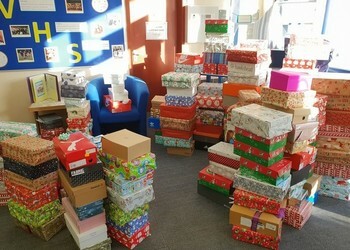 Ms Woolley said, "After learning about how the Jermain Defoe foundation supports and helps vulnerable young people in St Lucia and Dominica such as in the Holy Trinity Children’s home, Chelmer Valley students have gone above and beyond to make a difference by providing 219 shoeboxes of Christmas goodies, I couldn’t be more proud!"